When I was a kid growing up in the San Mateo Highlands, some of my most vivid memories were of my parents taking me to local parks and open spaces in the area. 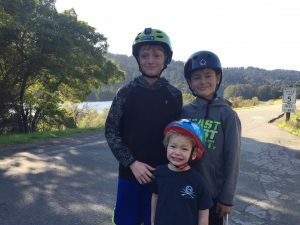 My family spent many afternoons walking Sawyer Camp Trail, investigating sea creatures at low tide at Fitzgerald Marine Reserve and camping overnight at Memorial Park. We’d picnic, hike, or just enjoy nature- parks were a fantastic refuge from the day to day of our normal lives. As a young child, these were amazing opportunities to learn new things and have freedom that I didn’t have in the classroom or at home. Looking back on it some of my best times growing up were exploring nature, and I feel fortunate to have had the chance to experience this at an early age. Now that I have children of my own, I feel it is really important to provide some of these same experiences for my own kids. My family is really busy and we have many competing priorities, but as a father I am trying to instill the same enjoyment of the outdoors that my parents gave to me. For my wife and I, the parks not only give us a break from our email inboxes, they also provide a unique opportunity to connect as a family. It is hard sometimes to compete with handheld gaming devices and a never-ending catalog of TV shows and movies at your fingertips, but the look on my kids’ faces when they see a new animal, conquer a trail or climb a new hill is nothing you can get from a video game. This Father’s Day, you will probably see me at one of our county parks with my three boys exploring and helping them learn about our world and natural resources. It is my hope that over the next few years I can show them to love our outdoor spaces as much as I do, and in turn teach them how lucky we are to have such a wonderful park system in San Mateo County. Father's Day, Fitzgerald Marine Reserve, Memorial County Park, parks, san mateo county, San Mateo County Parks, Sawyer Camp Trail, trails. Bookmark.